2.8" 3-Stage Rocker - a bucking pop off the wake for an explosive wake to wake style. Two Tier Rail - the board doesn't sit quite as deep on the water as a step down rail but has just as much edge hold. Deep Center Beam - super smooth landings even with a 3-stage kick. Two 1.2" P-Wing Machined Aluminum Fins - designed for a quick release and a moderate feel. Four 1.0" Deep Molded-In Fins - Hyperlite's thinnest and deepest molded-in fins for a knees bent style of riding that relies more on the outer fin. Deep Cupped Rails - a more responsive grip into a rail-ride turn. Vented Channels - less friction on the water when on rail for a faster feel. Jib Base - a stronger material with a more controlled feel for riders looking to get their jib on. 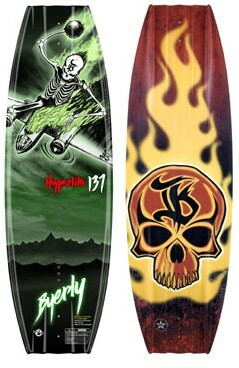 Butch Innovation - Scott Bouchard and Byerly continue to push the limits of progressive wakeboard shapes. Cons: Tracks like it's on rails with center fin. Had the opportunity to ride this board on several occasions, and I've always loved the pop it gives you. I find I get more pop with this than the Parks board. It'll really buck you right up, and frankly it is probably my favourite board in this respect. I personally perfer the last generation shape to this one, but it is still a great ride. I don't like the way this board edges as much as the previous shape, especially with the fins in. It's far to grippy, like it's on tracks. Once they are removed, it is however a much more enjoyable ride. I'd recommend this board to anyone how loves the aggressive and abrupt way a 3-stage board will buck you up off the wake. i love the pop this board has! i ride with out the fins on and once your comfortable without the fins you can ride any other way. I thought this is a great board, im a snowboarder and with out the fins it felt similar to the snowboarding feel, great pop a little inconsitance but with all 3 stage its like that. great sliding board.